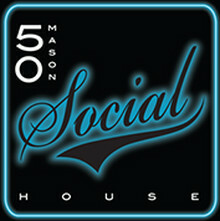 50 Mason Social House invites your senses to come alive. Inspired by the sultry scene that thrived here at the turn of the century, this cozy San Francisco newcomer offers an ambiance unrivaled in the neighborhood with subdued lighting, exposed brick walls, live music every night. The menu features varietals from across the globe, craft beers on tap, and house-made charcuterie.